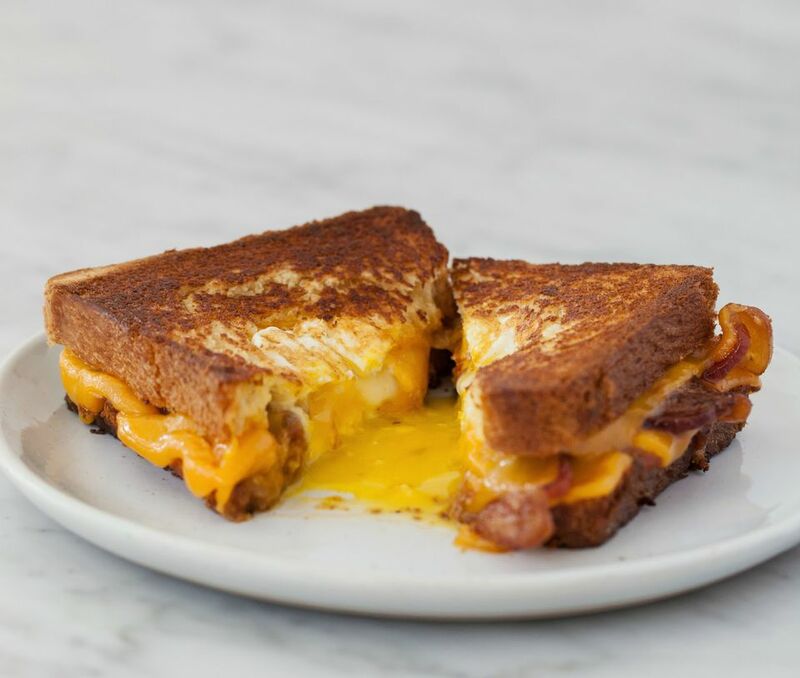 Begin by spreading tomato jam on 1 slice of bread and top with 2 slices of Cheddar and the bacon. Top with remaining 2 slices of Cheddar and remaining slice of bread. Using biscuit cutter or round cookie cutter, cut a circle out of the middle of sandwich, cutting through both bread slices. Gently remove inner circle and set aside. Cut-out circle can be grilled along with sandwich. In skillet over medium heat, melt butter and place sandwich and cut-out circle in skillet. Carefully crack egg into center cut hole. Sprinkle egg with pinch of salt and black pepper. Grill sandwich until one side is golden brown and egg has begun to cook. When egg white starts to become opaque, gently flip, adding remaining butter to pan. If you like your egg cooked through, gently press down on the egg part - if it gives a little, it'll be runny. If it's hard, it'll be cooked through completely. Once both sides are golden brown and egg is firm to touch, remove sandwich and allow to rest 2 minutes. Serve immediately, cutting in half to release egg yolk.